Tired of the chicken rice and nasi lemak set lunches? Especially if you are an expat working and living in Singapore for quite some time, you may feel like getting yourself a healthy bowl of salad for lunch every once in a while. But where exactly? 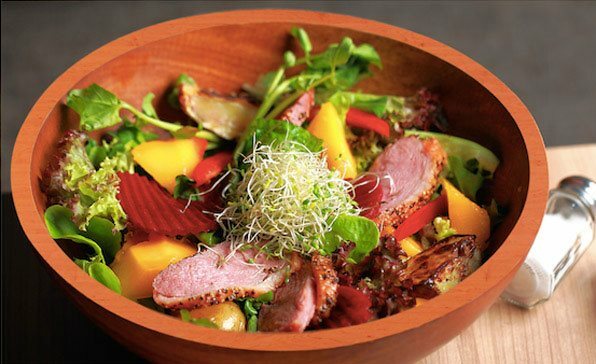 Today, we uncover for you some of the best salad spots in the heart of the Central Business District area. Want a salad place that will not send shivers down the 33 individual bones that your spine is made up of? Well, look no further than The Salad Corner in Amoy Street! Vouched by the many in suits and ties as the most affordable salad place in the heart of the Central Business District area, a hearty salad bowl serving at The Salad Corner will only cost you a slightly higher price than the usual local cuisine at your favourite kopitiam or food courts. Prices start from $4.90 for a salad bowl of your choice with five individual toppings and a single dressing. If that does not satisfy you, unleash your inner beast by up-sizing your meal for an additional $0.50 for one extra basic topping or $1.00 for the premium topping. Yes, we know what you might be thinking — affordable food, snaking queues. Given a choice, no one would want to get stuck in a long queue in their short lunchtime window. Or that feeling of exasperation when you passed the patience test of the long queue, only to find out that your favourite dish or, in this case, salad ingredient ingredients are sold out, and all of a sudden, your mind is spitting rhymes so sick and wicked that it may have cost you a spot in heaven. Rejoice, as at The Salad Corner, you are given every fighting chance at retaining your halo as they provide you with a hassle-free method of pre-ordering your food via SMS to cut down on your waiting time. However, do take note that their pre-order service is only available from 8 AM to 10.30 AM and that you are only able to swing by to collect your salad roughly about an hour later. If you are working near the Suntec City area that is renowned not only for its Fountain of Wealth, but also the wealth of eateries surrounding its five tower offices within a two-kilometre radius, you’d be pleased to learn about The Green Bar located at Millenia Walk which serves colourful and creative standout bowls salads with their combination of fresh ingredients and jazzed up homemade dressings that is sure to tickle your taste palates. All of its salad dishes are served in a quaint, charming wooden bowl that somehow presents you with a warm, refreshing feeling from your very first bite. Furthermore, the ambience at Green Bar is perfect to enjoy your bowl of salad and boost your lunchtime mood with its immaculate blend of unique and eye-pleasing décor accompanied by soothing classical background music. The Green Bar also has a sister outlet at Hitachi Towers, although it may not be as spacious as its main outlet over at Millenia Walk. This joint is a haven for salad lovers as it offers you with an almost endless list of salad choices and combinations. For example, if you happen to opt for a potpourri of salads fashioned by SaladStop!, you can select one out the twelve impressive signature salads or from the three classic ones. There is a total of more than fifty toppings and twenty dressings for you to choose from. You can also opt for some meat selection and premium ingredients such as rocket and almonds for an additional dollar — truly a bang for your buck. Feeling a little bit adventurous for the day? You can be Singapore’s very own Jamie Oliver and create your own salad at $9.50, where you can be sure to have all of your favourite salad ingredients in a single bowl. And whatever that they offer in a bowl, they serve in a wrap as well. Aren’t we truly spoilt for choice now! Everything about the Sumo Salad place spells fresh. In fact, they pride themselves for serving fresh and nutritious food in the Central Business District area. Something from the menu caught your eye? Just mention to the staff its name and the chef will whip it up fresh right in front of you. Not only is it fresh, but it is also prepped faster than The Flash knocking 30,000 times on Penny’s door on that memorable episode of the Big Bang Theory. If you are always in a rush, especially in the mornings, you can grab some healthy and tasty “fast” salad items such as its wraps, pasta and long rolls, among others — all of which are prepared with the freshest ingredients daily for you to pick and run during the morning rush hour. Not everything at this Shenton Way outlet is pre-made, you can choose to create and design your own salad bowl as well! You can choose for yourself five toppings out of the many of them, along with an almost unlimited range of herbs and dressings.